You are browsing the archive for digital image-making. Former editor of The Guardian, Peter Preston has written a piece in The Observer newspaper bemoaning the decline in numbers of editorial or political cartoonists being used in newspapers. You can read it here. Preston focuses on recent job losses in the United States, which mirror the speedy decline of the print media there, but this trend has been long established. 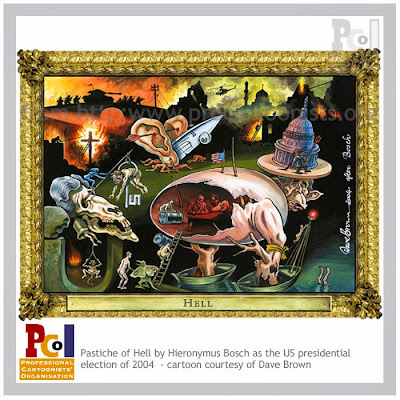 The Association of American Editorial Cartoonists made an awareness campaign – Black Ink Monday – back in 2005 in which all the practising professionals in US newspapers devoted a day’s work to highlighting a decline in the published drawn art form. So, Bloghorn thinks Preston’s observations are a simple statement of fact. There are many fewer cartoonists employed by both UK and US newspapers than there were in the heyday of the print media before the advent of the 24 hour digital publication tools. The decline in the use of print cartoon content comes as the media companies who own the print products reduce their costs to try and maintain their profits in competition with the digital media. Preston also argues the digital media doesn’t suit the traditional drawn forms of communication, Bloghorn doesn’t agree on this point, but thinks the old print and emerging digital media industry is yet to find right method of presentation for the future of drawing about life. If you know better please tell us why in the comments below. The cover of The New Yorker magazine was drawn by Jorge Colombo’s finger which manipulated an iPhone application in the fashion shown above. Good on them and him. Here is an experiment in online imagery using the work of PCOer Alex Hughes who helps write this blog for the Professional Cartoonists’ Organisation. Link via Paul Bradshaw. One of the problems in being able to express yourself through drawing is having your work “borrowed” or “passed off” as the product of someone else. This is an occupational hazard if you draw to make your living, but it is irritating. Actually this is theft because traditionally, full-time, commercial artists and cartoonists sell the rights to publication of their work. This business model is destroyed by free and easy copying. The Bloghorn is going to highlight particularly bad examples of this as and when they turn up. To illustrate this intent, here is a link to an example of image theft from early in 2007. 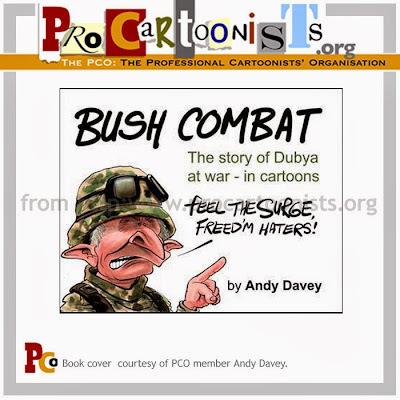 It comes from the blog of Matt Buck and concerns the work of fellow member Andy Davey. There was some interesting follow-up to the actual theft of Andy’s images and fellow PCOer Morten Morland blogged about that. One more offering from the “But is it Art?” cartoon show from the forthcoming Shrewsbury International Cartoon festival. 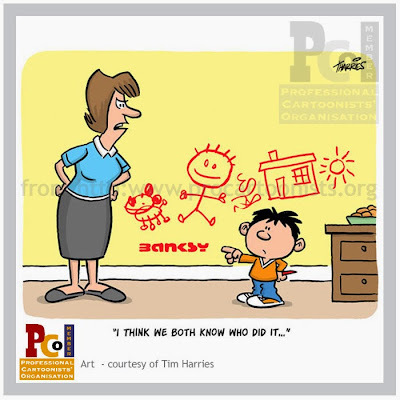 This piece is from PCOer Tim Harries. 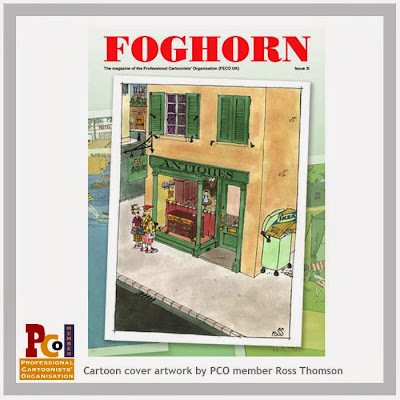 Foghorn, the full colour magazine of the Professional Cartoonists’ Organisation is in production right now and is due to land on the desks of some lucky art buyers soon. This all new exciting flood-proof issue will include articles from PCOers Martin Honeysett, Martin Rowson, Roger Penwill and Pete Dredge alongside the usual top jokes and regular features. This edition’s cover cartoon is by Mr Ross Thomson – click T for Thomson.